So a couple months ago I was told the reason for all the pain I've been having over the course of 3 years is due to miserable malalignment. I recently turned 18 so this diagnosis came from a children's doctor. When I went to see the doctor hey told me that the cause of my pain was due to the fact that my hips are turned inwards. This is evident because I have a full range of motion outwards ( laying on my tummy I can bend my legs and lay my feet out to the side like a "w") and have my legs flat against the ground. Anyways this mis alignment has cause my tibia and femor to turn opposite ways over the course of 2 to 3 years. The result is that I have severe pain in my hips and knees . I am very athletic and love walking but not its to painful to simply walk around school. I was told the only solution to fix this is through surgery, which at this point I would be very happy to go through with, but I was also told that no one will do the surgery ( it would be breaking and re aligning both my tibia and femor) if the pain wasnt enough for me to endur a year of recovery, I have become serverely self concious because its is very noticeable. 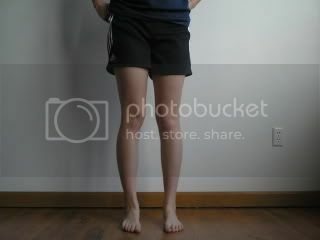 In the anatomincal position ( feet pointing straight) my knees are almost completely sideways, primarily my left. Only recently has it become noticeable in the way it affects how I walk since I cannot bend my knee over my toes. ( it bends totally inwards) compinsating for this bending has only made my hips worse and it is becoming a very vicious and painful cycle. I can't take it anymore and I am desperate to know what will help me. Should I get another opninnion? Exercing is way too painful and I have been giving many excersizes to do to strengthen my muscles that are suppossed to help re align my legs, all that has resulted from this is my legs have gotten worse but at least my muscles are nice and toned. I am also worried for my future . Will this continue to progress and how mobile will I be in the next couple of years? I was diagnosed with accute skoliosis as a child so I am also wondering if this may have been a result of that? Help would be seriously appriciated. I am a Shriner and we own and operate 22 hospitals around the US, Canada and Mexico that specialize in childhood orthopedics. Call this number to see if they can refer you to one of our hospitals 800-237-5055. They may be able to help as the probably have seen this condition before. We accept patients up to the age of 18 so you're just at the threshold. If they can correct your condition, they will still see you beyond the age of 18 as long as your a patient in our system and the doctor seeing you get a waiver to continue your treatment. Good luck and post back of you are able to use our services. Unfortunately you are a member of the twistees! There are a quite a few of us lurking on the site. My first thing to say is you aren't alone, and there is a solution. The most important thing is finding the right doctor. There aren't very many of them who will do the derotations to correct the bones. I was exactly like you, and you can look back at my post op diaries and original post when I put pictures and was looking for a solution. Someone referred me to Dr. Robert Teitge in Dearborn, MI. He since then has derotated both my femurs. Unfortunately my left leg has still been causing me pain, even after the derotation and hardware removal. It's been about 5 years since the original derotation, and just recently we made the decision to have Dr. T operate again, but this time bring my femur back in a couple degrees because the original derotation was too much for my muscles and tendons to handle. But alas, note that my right leg is amazing after the derotation, if the left was as good as the right I feel like I could do anything! If you have any questions feel free to ask, I'm not a doctor but i've been through the derotations before. Thanks so much, it's nice to know I'm not alone. I've been sent to so many doctors and specailasists and they all tell me different things, most frustrating thing is they usually just look at me and give me a diagnosis with out any examination really. The doctor I went to was at CHEO in Ottawa . right now my main concern is if it is gonna get worse because I'm so active or if it'll get worse with just getting older.? I would just really like to not have to quit being so active. I could very well be wrong, but I know my doctor told me the angles of the bones wouldn't get worse but the pain possibly would. Speaking from experience the pain for me got progressively worse, and there are certain activities which trigger the most pain. Skiing is one of them, and riding a big horse with a bumpy stride is the other. There's something about those two particular activities, both of which I love to do, that sends me over the edge of the proverbial pain scale. Lately my pain on a daily basis has been higher and that's what I went back and we decided to do another surgery, I figure I'm only 24, I don't want to have to feel older than I am unless I've exhausted all my options. It is obvious from the pictures that you have a severe torsional problem, which totally explains your knee pain. I have myself the same condition but less severe as yours. From the pics and your description, I would say that you have at least 45° of femoral anteversion (inwards torsion of the femur). It could even be more (50-60°?). Sitting in the W position as you do requires at least 40° of femoral anteversion. Normal is 10-15°. Only a few surgeons know about this condition and have the expertise to correct it. Lindsey mentioned you Dr. T in Michigan. Dr Mark Sanders (I believe he is in Houston) is another O.S who has operated succesfully many people on this forum. If I lived in the US I would go to visit one of them for sure. Personnally I live in France so I cannot usefully refer you to anybody. What I can tell is that if you do not do the surgery, things will likely only get worse. I am 39 years old, my torsional deformity is much less severe than yours but I have seen my condition worsening with time. When I was your age, my symptoms were only mild. Today, I cannot do sport, sitting with bent legs is painful, I have lesions in my cartilage, and as you know treatment options to regenerate cartilage are still in infancy, so don't wait until your cartilage is damaged!!! -Unfortunately there is no simple solution to this problem. Derotation osteotomy is the only validated treatment for this condition. And if you look at the testimonies of other twistees on this forum you will know that this surgery works very well. Published case series also attest to the effectiveness of this surgery. But it has to be performed in the hands of a surgeon that is very experienced in this particular surgery, because it is not an easy one. Actually very few O.S have meaningful experience doing it (or even know about it!! ), so why take any risk and go to a surgeon who does not know???. One (positive) thing I would like to tell : You are unfortunate to have this condition, but be happy because there is a proven time-tested solution to it, and you have come to the right place (this forum) to get the information and advice you need. I really wish I knew about my torsional problem when I was your age but unfortunately it went undiagnosed for so many years. I discovered my condition at age 37, as I researched about my knee problem on the web. The earlier you treat the problem, the better!!! And you are at the best age to do this surgery as your bones will heal fast. Also : do not hesitate to travel to get the best care for you. I was operated in Montpellier, South of FRance, which is 750 km away from Paris, where I actually live. Most people do need to travel to get operated in the right hands, because it is a rare condition and the O.S next door will most probably not have the expertise to do the job. Re: miserable malalignmentive gotten more information here than in the last four years. From the w pog my foot forwards to my armpit so I do know that the amount it is turned is significant. I do have 2 more concerns though, one being my weight, I'm 110lbs and around 5'8 so I'm not the biggest girl in the world, if I gain weight how much will that affect my knees? Also I am very fit and very toned, bit I have been noticing that the muscle right behind my knee is significantly more developped than the other muscles of my legs and is starting to bulge. Would this be a comoensation of the angle my knees are forced to bend at? Myself, when I was 8, I could sit in the W position like you (frog position), because my femoral anteversion at that time was exceedingly high. At age 13, this posture was no longer possible for me as my femoral anteversion had reduced significantly (unfortunately not enough to keep me away from patellofemoral problems!). If you look in the literature at published cases series of derotation osteotomies you will notice that most patients operated are in their late teens or early twenties (even though there are older people like me who get the surgery done). My surgeon in France who is one of the most experienced O.S. in this surgery, told me that most of his patients are in their late teens and that they get the surgery done in July after their exams so as to be able to go back to their classes in September or October. You will not need 1 year to recover!!!! it just does not make sense.... 1 year may be needed to get a full recovery and to get back to more intensive sports, but at 3 months post-op you can expect to be off crutches, back at your normal daily activities... Myself i am six weeks post-op and I am doing fine (still on crutches, but without any pain and expecting to go back 100% to my work in 4 weeks max ; i could already go back to work now but I prefer to focus on rehab at this stage). As for your concerns about weight : it is well known that more weight means more pressure on the joint (i don't know however if there is a linear relationship like 10% more weight means 10% more pressure or whether the impact is more than proportional ...). In your case the problem is not the weight i believe but the torsion, so I would suggest not to worry too much about your weight. The challenge for you is now to meet a surgeon that is experienced in this procedure not too far from where you live, if he/she exists at all. If you go and consult random surgeons in your city/region, be prepared that you will likely face more ignorance, i.e : reactions / answers similar to the ones you had from the doctor you already consulted. Indeed, most doctors either (i) don't know about this pathology ; or (ii) they don't know that the only solution to is is derotation osteotomy, or (iii) they believe the mordidity of this surgery is too high. In most cases surgeons will say there is no indication for surgery because they have been taught so. In the worst case, they will offer you to perform another procedure , like an isolated lateral release or a tibial tuberosity transfer. In this case just run away, because it has been well documented that the result of these procedures is not so good in presence of torsional problems !!! Surgeons tend to advocate the procedures that they know. "If your only tool is a hammer, every problem looks like a nail"
It might also be that, like me, you will meet surgeons that have experience doing only tibial derotations (or only femoral derotations). Some surgeons will possibly offer only a partial solution. In my case, two surgeons advocated that I should have derotated only the limb with the most significant deformity : my right tibia. But I was not happy with that solution because I knew my deformity was bilateral (right and left side) and both in the femur and tibia. Also, my pain and chondral lesions were in both knees, so why operate only the right tibia? Later, I got opinions from other surgeons who advised that I should have my four limbs derotated, and I was convinced that was the way to go. If you do it this way, surgery will extend over several years. When maltorsion is present in all limbs, it is more effective to correct all deformities one leg at a time. Unfortunately you cannot do both legs in one single procedure because that would be a too heavy and risky procedure and rehab would be too difficult as you would have to be in a wheelchair all the time. It is likely that some doctors will advise you to stay away from derotation osteotomies. For instance, one of the top knee surgeons in France told me that he does not perform derotation osteotomy because he considers it is a multilating surgery. Others will be more balanced : I met several surgeons who told me "the surgery can be done, but it has to be though of well because it is not a routine procedure and there are some risks involved (peroneal nerve palsy, compartment syndrome...). After consulting leading surgeons in several cities of France and abroad , I finally met an O.S who told me : "I have performed this procedure about 200 times since 1986 : it his my passion and I can fix your problem." he told me not to worry too much about the risks that I had been told about by other surgeons. He told me that risk is "operator-dependent" : A less experienced surgeon in the same surgical unit/department or at a different hospital will likely report a complication rate four times higher when performing this surgery if he does not know well all the pitfalls of this surgery. This is the "learning curve"
Would these images be considered a severe case?